The idea of translation can give a lot of room for interpretation. To translate is in itself already an action that can have multiple meanings. Presenters Ahmad Diab, Anneka Lenssen, and Kathy Zarur interpreted some of the outcomes related to this discussion through an informal roundtable around one particular piece of writing that broadened the idea of translation beyond words. “We are going to open the evening with a reading”. The presenters chose “Drawing in Three Dimensions” (1971), by Palestinian artist and inventor Vladimir Tamari as the focal point of the conversation. The piece was first recited in Arabic, its original format, and later read in a translation to English. Afterwards, each one of the presenters shared their view and interpretation of Tamari’s essay incorporating criticism around translation in its various forms. It was interesting to see how the content and form of the lecture would go along the same lines. What at a first glance would appear to be a discussion on linguistics or literature, rapidly and clearly, took a turn. Translation gained a new perspective beyond shifting from one language to another, but to different mediums. Translation more than ever, was understood as a tool. Through his writings, Tamari explained his latest invention: a device for tri-dimensional drawing. “Every tool has a use”, the text would explain, advocating for the physical apparatus. But the poetics of this specific tool is particularly engaging for the simple fact that it adds a new dimension to our representation and understanding of the world. It translates it in a different perspective. The tool, thus, is a tool for translations. It is not hard to see how Tamari came to incorporate this conversation into his works, as technology was gradually becoming an important matter in the fields of philosophy and design, permeating the works of other authors and thinkers such as Bruno Latour, or Vilem Flusser. But Tamari’s differential is the multi-facets of his tool: it is both a physical object/ invention, and a political and philosophical discussion. Tamari poetically and physically makes us see lines and space differently, but only through the lenses of his tool. The object, similarly to 3D glasses today, combines two images into one. Without the glasses, the two drawings remain separate, and missing the third perspective. The lecturers, then, brought their own viewpoints and translations to the discussion as well as the correlations of Tamari’s text to the “Palestinian Question”. Understanding the text through its metaphors, Anneka Lenssen starts by pointing out how Tamari creates a bridge between concepts of language and place when presenting his tool as a way to solve a specific spatial desire. Ahmad Diab explains that “desire” in Arabic means something like “if you will”, thus, an action to be taken. This spatial desire is therefore, trying to be solved, (taken action) through the use of his tool, his device that ultimately helps rethinking relations of power through space. We can also look at Tamari’s writings (text) and its political content as much of a tool as the object he created. It is one of the many possible platforms of translation. With that, we come back to the linguistic aspect of translation. How can one assure fidelity to the original format? This brings to light the need to understanding that beyond being a tool, translation is also an interpretation. 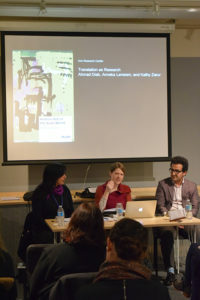 To celebrate the upcoming publication of the anthology Modern Art in the Arab World: Primary Documents (New York: Museum of Modern Art, 2018), co-editor Anneka Lenssen (Assistant Professor, Global Modern Art, UC Berkeley) joins Ahmad Diab(Assistant Professor of Arabic Literature, UC Berkeley), and Kathy Zarur (curator and Lecturer in Visual Studies, CCA) in a conversation exploring the possibilities of translation as artistic research. The event will feature brief readings in English and Arabic of texts in the anthology and a discussion of related works of art. In turn, specific of acts of translation (whether between languages, or between text and image) will be examined in relation to problems of global canon, world literature, and the internationalism of socialist pathways of cultural exchange in the 1960s and 1970s–the latter engaged in its own, important translational projects. 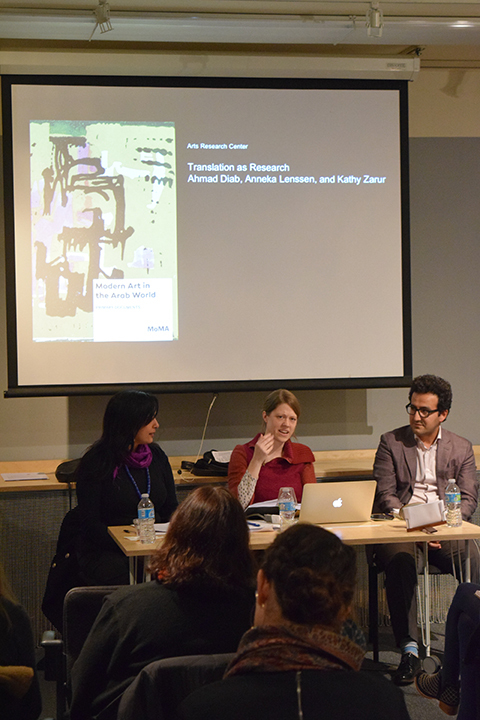 In light of recent efforts in the United States to revisit and revive Arab modernist and avant-garde histories by means of translation, how do we understand the hopes and challenges of this period? To what extent did artists themselves, located in complicated colonial and post-colonial conditions, already work by translation—between languages, materials, and worldview? And in what ways might such translations-as-research intervene upon contemporary cultural practice? Learn more here.